U.S. stocks were little changed following Friday’s selloff. Treasuries and the dollar steadied. Consumer and industrial shares led gains in the S&P 500 Index, while technology companies retreated. Ten-year Treasury yields traded near 2.44 per cent after a closely-watched part of the U.S. curve inverted on Friday as investors wager the Federal Reserve will need to cut rates. The greenback dropped against most of its Group-of-10 currency peers. Oil slipped on concern that a slowdown in global growth will erode fuel consumption. The risk rally has come under scrutiny after stock valuations climbed near levels reached during the height of last year’s euphoria. While weakening data and a pivot by global central banks away from tighter policy is shaking confidence, a breakthrough in U.S.-China trade talks could provide support going forward. Investors also digested news that Special Counsel Robert Mueller found no evidence anyone close to Donald Trump colluded with Russia in the 2016 presidential campaign. “It’s mildly positive for risk assets, but only very mildly and not nearly enough to overcome skittishness and downward pressure from continued weakness in global economic data,” said Aaron Hurd, a senior portfolio manager in the currency group at State Street Global Advisors, whose team manages US$104 billion. The pound rose at the start of a week that could bring yet another vote on U.K. Prime Minister Theresa May’s Brexit plan. Chancellor of the Exchequer Philip Hammond and other cabinet colleagues publicly backed May on Sunday as several British newspapers said she’s under increasing pressure to stand down over her handling of Britain’s exit from the European Union. European shares fell even after data showed confidence among German companies improved. 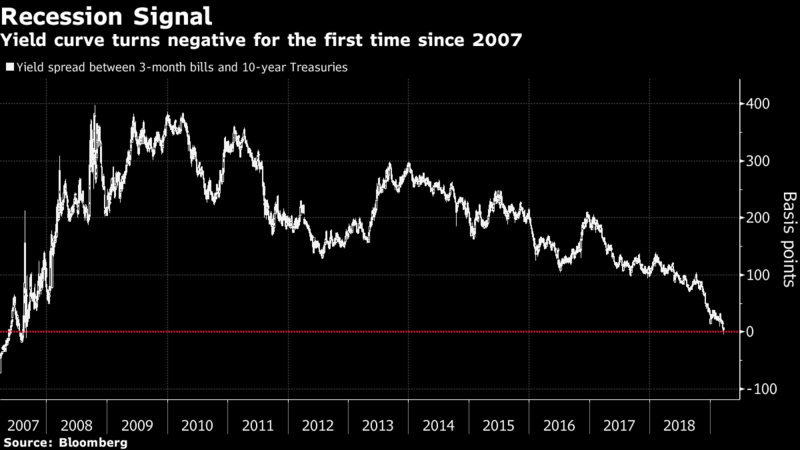 Australia’s 10-year bond yield recorded an all-time low and Japan’s hit the lowest since September 2016. The Turkish lira recouped some of its Friday slump, which followed the start of an investigation by the country’s banking regulator into JPMorgan Chase & Co. and another probe of unspecified banks for stoking the currency’s plunge. -Apple Inc. unveils new products including video and magazine subscriptions on Monday. -U.S.-China trade talks resume, with a cabinet-level American delegation due in China. -U.K. Parliament is likely to stage several key votes on Brexit. -China’s Boao Forum for Asia holds its annual conference this week. -A top Chinese government leader will deliver a keynote speech, and officials including Central Bank Governor Yi Gang and Finance Minister Liu Kun are scheduled to speak. The S&P 500 Index fell less than 0.1 per cent to 2,799.62 at 11:04 a.m. in New York. The Dow Jones Industrial Average added 0.1 per cent, while the Nasdaq-100 Index lost 0.1 per cent. The Stoxx Europe 600 Index decreased 0.4 per cent. The MSCI Asia Pacific Index declined 2 per cent. The MSCI Emerging Market Index fell 1.2 per cent. The Bloomberg Dollar Spot Index declined 0.1 per cent. The euro increased 0.2 per cent to US$1.1322. The British pound climbed 0.1 per cent to US$1.322. The Japanese yen fell 0.1 per cent to 110.01 per dollar. The yield on 10-year Treasuries was unchanged at 2.44 per cent. Germany’s 10-year yield gained less than one basis point to -0.01 per cent. Britain’s 10-year yield fell less than one basis point to 1.011 per cent. The Bloomberg Commodity Index declined 0.1 per cent. West Texas Intermediate crude fell 0.9 per cent to US$58.49 a barrel. Gold gained 0.5 per cent to US$1,320.03 an ounce.